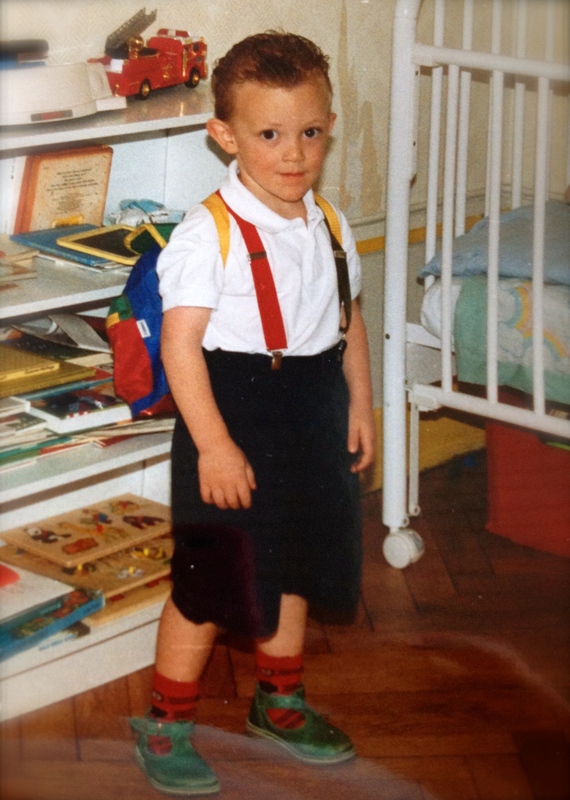 Ready for his first ‘rentrée’: my son, Elliott, in the early 90s. It’s been more years that I care to remember since I went back to school. Also quite a few since I took my kids for their first day of école maternelle. But every year in the first week of September, I get that back-to-school buzz. It feels like the real start of the year. ‘La rentrée des classes’ heralds much more than just the start of a new school year in France. It’s the rentrée for a whole new schedule of radio and television programs, sporting activities and holidays. It’s also the return of political infighting, strikes and tax bills. We got off to a running start this year, with the entire government under Manuel Valls resigning at the end of August. 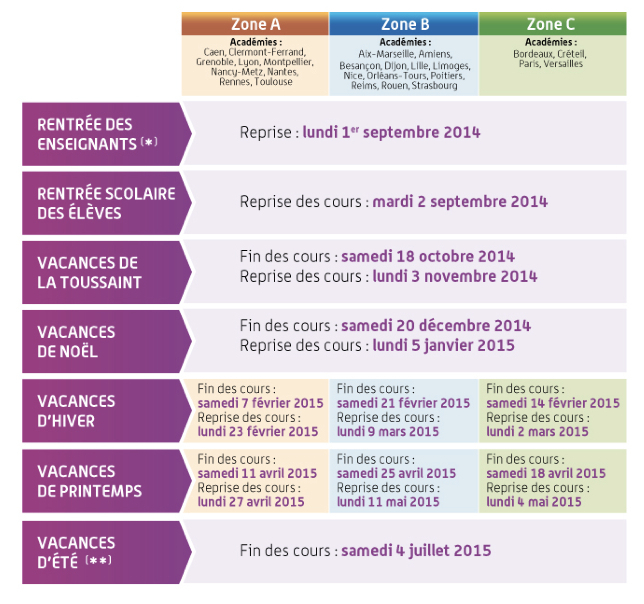 The school calendar, set by l’Education Nationale, provides the structure and framework for French life. France is divided into 3 zones: A, B, and C. This is supposed to help control the chaos on the roads when everyone heads for the ski slopes in February. I like being in zone A, mostly because Paris is in zone C. That means fewer traffic jams for us, although we still get stuck in the stream of vacationers on their way to and from their holiday destinations. Spreading out the school breaks helps ensure a profitable few months for the resorts during ‘les petites vacances’ in the fall, winter and spring. The year-end break at Christmas and ‘les grandes vacances‘ in the summer are the same for all. The French returned in droves from summer vacation last weekend. There are always the inevitable ‘tardataires’ (late-comers) who must stay away until the last possible moment, but the poor weather this year added to their number as people delayed their departure in hopes of sunnier skies. The lineups at les grandes surfaces (shopping centers) were long as parents jockeyed to get that last item for the long list of school supplies. They don’t really have to have everything on the first day, of course, but we all have such a sense of fear and awe for the educational system in this country that we daren’t send our children to school without that heavy cartable loaded down with every item the teacher has indicated will be essential for the school year. We are talking about hundreds of sheets of loose leaf paper, whose squares must be of a defined size and color, a specified number of pens and pencils and rulers and erasers and notebooks of various types. In primary school you must add gym slippers and coveralls for art class. Pity the poor parents desperately seeking to satisfy the list. I remember it well. And am feeling just a tad…nostalgic for those lost years. So today I will go to the local papéterie (paper shop) and buy myself several of my favorite writing tools: fine-point pens and sharp pencils and bright notebooks. Just for old time’s sake. What an adorable photo of your wee laddie. I adore those green shoes. It’s amazing what brings those memories back. It all goes so fast hey? I remember being told that when my lads were born and it seemed like such a cliche. At 7 and 10, I think of those crazy baby days with a fond heart. (Yes, even nappy changing.) Here, our big break is in January, so hot weather, ice cream and swimming at the beach heralds the start of our school year.